Please do not delay as the initial closing date is May 19, 2016, at 5:00 pm Alaska Time. If you have questions about the position, please contact Ed Kazzimir at 786-7699. Members of FLIP and of the Anchorage Chapter of the Alaska Library Association (AkLA-A) are invited to a special tour of the Alaska State Court Law Library on Friday, May 13th from 12noon-1pm. Law Library staff will be providing a tour of the facility and its unique resources for both FLIP and AkLA-A members. *Allow plenty of time to find a parking spot and remember to bring money to feed the meter. Do you love working with teens and youth? Would you like to spend your summer working with library staff to engage Anchorage youth in lifelong learning? Consider becoming one of our Summer Associates! Who is eligible to apply? Interested individuals with a minimum age of 20 and a High School Degree or Equivalent. Must be available to serve from May 23 to July 30, 2016. 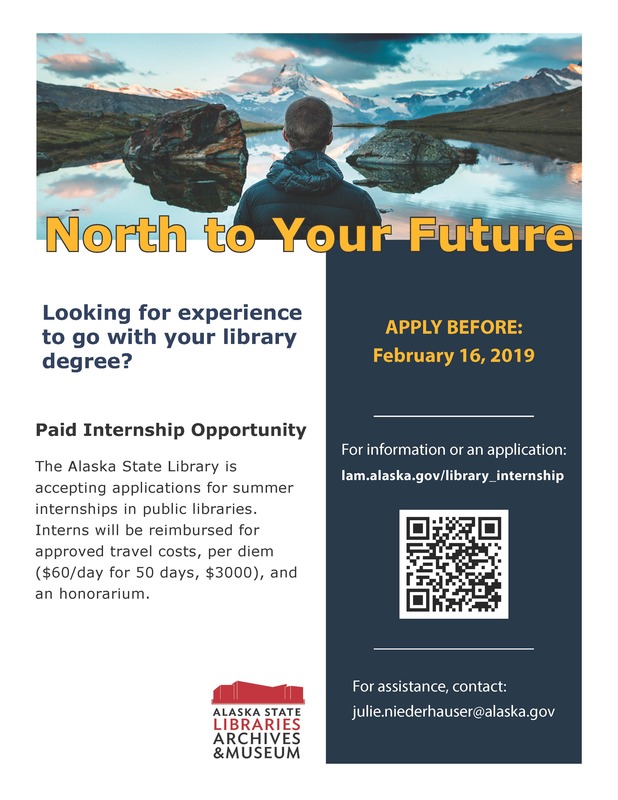 We will have one Summer Associate at the following locations: Z. J. Loussac Library, Muldoon Library, Mountain View Library, and the Chugiak-Eagle River Library. Review of applications—April 14, 2016.